Welcome to SPARK Baltimore held in the Greenmount West Community. The Spark Expo is a community inspired festival for artists, tech, and maker enthusiasts. Located in the Hub of the Baltimore Arts District, the Greenmount West Community is filled with local and student creatives, artists, and makers who seek to showcase their work. The Greenmount West Community is also home to several art spaces, businesses, and schools such as Open Works, the Tool Library, City Arts & City Arts 2, and the Baltimore Design School. 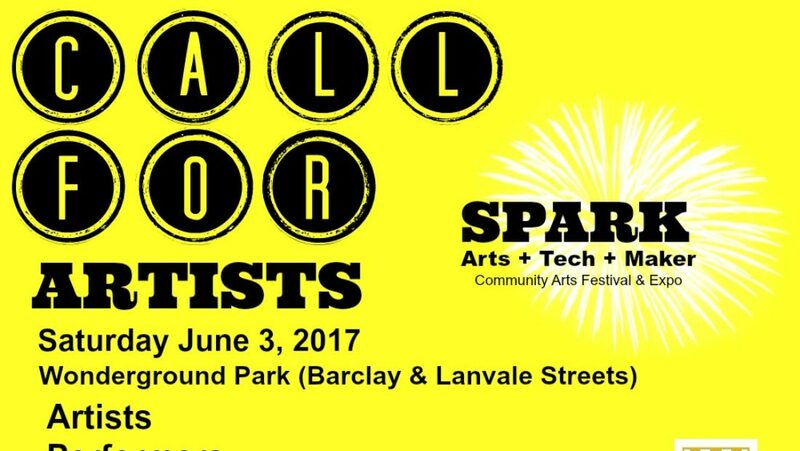 The Spark Expo will take place on June 3rd 2017 in the Greenmount West Community from 3 pm to 9 pm with opportunities for artists, vendors, and community and business sponsor opportunities. The day will include a lineup and mixed schedule of art demonstrations, youth programming, art exhibitions, short film presentations, and tech and maker interactive gaming to increase community engagement in the arts. ARTISTS: Only the sale of original artwork will be accepted. Artist Vendor Lot is reserved for individual artists to sell their handmade original and reproductions of original art works to include, paintings, clothing, photography, pottery, sculptures, etc. We will not rent space for commercial businesses for resale. Resale items including but not limited to: clothing (including vintage), toys, books, shoes, novelty items; Plants (unless being sold in a handmade original pot); incense, perfumes, body oils, soaps or other cosmetic products that come into contact with the human body or skin; food items of any kind; drug paraphernalia; or gang-related artwork. CRAFT: Original craft work is also available for sale and includes work by the artist in the following areas but not limited to wood carving, furniture making, weaving, paper modeling, pottery and glass, mosaic, jewelry and other metalwork. VENDORS: Food/ Beverage/Merchandise have exclusive rights to sell food items and distribute samples. We will also accept a limited amount of food truck applications. Please specify the type of food services you will provide. Food and beverages may not be sold or distributed by arts & crafts vendors or non-profit organizations. You may bring a cooler and keep drinks & food in your vendor space for your personal consumption. VENDOR FEES: This is a straight fee only opportunity. No other rights or reservations will be permitted. ART & CRAFT VENDING FEE: is $25 per 10 x 10 ft booth space, limit 2 spaces. Payment is not required with application. Vendors will be sent payment information upon acceptance. FOOD and BEVERAGE FEE: is $40 per 10 x 10 ft space. Limited power supply will be available upon request. FEE is for Space Reservation only. Additional FEES may be required for power. are invited to reserve 15 minute slots on the Greenmount West Open Mic stage. This includes bands, MCs, poets, dancers, and performance artists. Submit a description of your work with a link to samples on the form below. Deadline for performing group submissions is May 20th and will be specifically coordinated by BROS. For more information contact aran@baltimorerockopera.org.